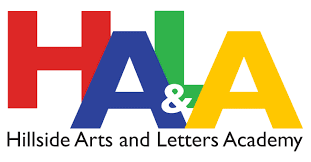 Last Friday, your blogger once again was a guest at HALA, The Hillside Arts and Letters Academy, a New York City public high school located in the historic Jamaica High School building in Queens, New York. Created as part of a New York City initiative to close large, academically failing schools and to replace them with smaller schools, HALA shares its current building with three other schools and all four schools share an auditorium, cafeteria, and sports teams. HALA opened in 2010 and your blogger has visited for numerous functions over the years; one of the two current Assistant Principals is Matthew Yellin. Matt began his teaching career at HALA and continues to teach a class or two each semester, even as his primary role has changed. And he continues to recruit his family and friends to assist at school events. But this post isn't about the terrific students I met during Senior Interview Day, when 12th graders prepare a resume and submit to mock interviews for "jobs" in their hoped for fields. It isn't even about the excellent scores this school achieved during its reviews by the NYC Department of Education. What was striking about this visit was how I felt about the metal detectors that all students and visitors to the building need to pass through whenever they enter. For several years, each time I visited the school, I was troubled by the security procedures, even though the safety officers were always polite to me and seemed efficient. When I mentioned that this must be an issue for the students, it was explained that it was a real inconvenience, especially when large numbers of students were arriving at once. I was told, this level of security went back to the day when Jamaica High School was a single school, with thousands of students. Still, the process made me uncomfortable. I am still troubled by these devices, but for a different reason. Now I am grateful that the students -- and the staff -- are protected by metal detectors. I am not so naive as to think that these devices or the folks that operate them are foolproof, but I appreciate the level of safety they offer nonetheless. And I am sad that the world in which we live, where school shootings seem to pile one upon another, has managed to change my mind about the need for this level of security. Very sad.